Winter Weeds: Control or Not to Control? Recently we received several phone calls about winter weeds, particularly marestail. It is important for growers to decide now if they want to apply a herbicide. The following FAQs about winter weeds can help growers make a decision. 1. What winter weeds should growers watch for? The most common winter weeds in Nebraska are marestail, henbit, field pennycress, prickly lettuce, shepherd’s purse, downy brome, tansy mustard, and dandelion. 2. Is a fall herbicide application needed? Not necessarily. Herbicide timing to achieve the most effective control varies with the weed species present. Field scouting (see this Crop Watch article) and weed identification (see EC 304) are important. For example, if you see a lot of marestail, a fall herbicide application is needed. 3. Why focus on marestail? Marestail is a significant problem weed in Nebraska. Most marestail in Nebraska is resistant to glyphosate and the ALS group of herbicides and is challenging to control with only a glyphosate burndown program. A recent survey reported that more than 2 million acres in Nebraska is infested with resistant marestail. 4. Why do you think a fall herbicide treatment is important in controlling glyphosate-resistant marestail? Marestail can emerge in the fall and in the spring. However, most marestail in Nebraska is fall emerging and more effectively controlled then when it's in a seedling stage. 5. What do growers risk if they don’t use a fall herbicide treatment to control glyphosate-resistant marestail? Growers can choose an early spring application of herbicides; however, sometimes early spring weather is not very cooperative. For example, this year, early spring was too wet and growers couldn't apply early spring burndown herbicide applications. In fact, pre-emergence herbicides also were not applied due to wet fields, leaving post-emergence herbicide applications as the only option to control marestail. By then, the marestail was too tall to be effectively controlled. Additionally, options for effective post-emergence herbicides are limited (see this Crop Watch Article). 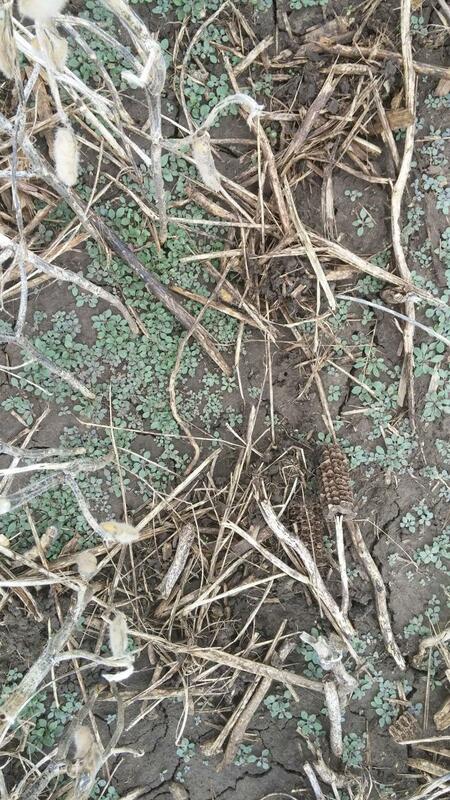 Variable response has been observed with early spring application of herbicides for marestail control. Some biennials and cool season perennials, including dandelion, wild carrot, and poison hamlock, also can be controlled more effectively with fall herbicide application. 6. Do winter annual weeds act as alternate hosts to soybean cyst nematode? Yes, six winter annual weeds have been identified as alternate hosts to soybean cyst nematode (SCN). SCN can reproduce in the field on henbit and purple deadnettle. For more information, see this Purdue University resource, "Winter Annual Weeds and Soybean Cyst Nematode Management." 7. When to control winter weeds? UNL research has shown that most fall emergence was completed by early November, thus, targeting herbicide applications from late October to mid November would be important. Younger weeds tend to be more susceptible to herbicide treatments than those at an advanced growth stage. 8. What herbicides to consider? Several herbicide tank-mix options are available for control of most winter annual weeds. Consult pages 61 (corn) and 105 (soybeans) of the 2015 Guide for Weed Management in Nebraska (EC 130) for effective options. Read this Crop Watch Article.